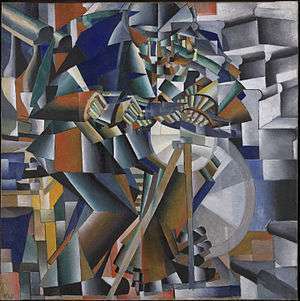 Cubo-Futurism was the main school of painting and sculpture practiced by the Russian Futurists. When Aristarkh Lentulov returned from Paris in 1913 and exhibited his works in Moscow, the Russian Futurist painters adopted the forms of Cubism and combined them with the Italian Futurists' representation of movement. Kazimir Malevich developed the style, which can be seen in his The Knife Grinder (signed 1912, painted 1913), though he later abandoned it for Suprematism. Cubo-Futurist sculptors included Joseph Chaikov, Boris Korolev and Vera Mukhina, all of whom taught at the Soviet state art school in Moscow, Vkhutemas. West, Shearer (1996). The Bullfinch Guide to Art. UK: Bloomsbury Publishing. ISBN 0-8212-2137-X. ↑ Parton, Anthony (2009). "Cubo-Futurism". Museum of Modern Art. Oxford University Press. Retrieved 7 June 2011. This article is issued from Wikipedia - version of the 1/19/2016. The text is available under the Creative Commons Attribution/Share Alike but additional terms may apply for the media files.